First, bake your brownies following the instructions on the box. Let the brownies cool before you cut them. In the meantime, mix the pudding mix together following the instructions on the box. To assemble the dirt and worms: in a glass trifle dish, layer the bottom layer with a handful of the Cookies and Creme Chex Mix™. Next, layer two heaping tablespoons of pudding. Then, sprinkle some brownies on top and throw in two worms. Serve and get creeped out! 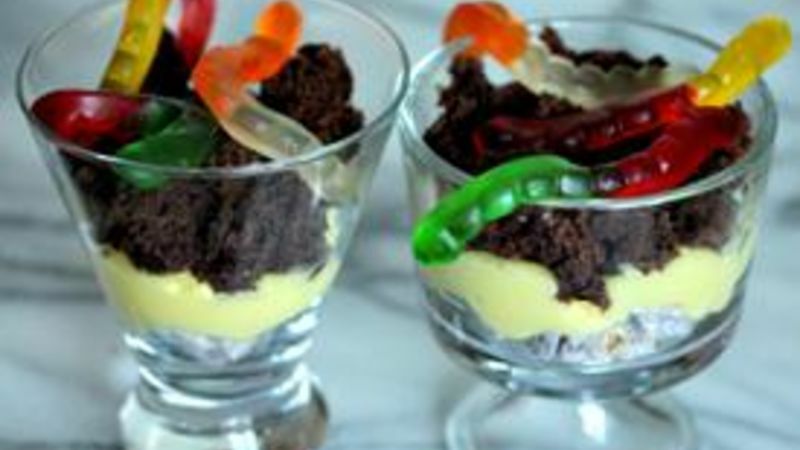 Dirt and worms aren't usually on the menu, so why not serve some at your next Halloween bash? Everyone looks for gross treats on Halloween. It’s expected! Kids will especially love the grossness of this dessert dish. They can also help build it and add as much “dirt” or as many slimy worms as they want onto it. Guests will love that all the ingredients in Dirt and Worms are all edible and delicious at the same time! And thanks to Betty Crocker Brownie Mix, it’s easy to make this layered heavenly treat! Grab your main ingredients - Betty Crocker brownie mix, Chex Muddy Buddies and vanilla pudding. You’ll want to follow the instructions on the brownie box for making the brownies. Pour the batter into a pan. In the meantime, make your vanilla pudding following the instructions on the box. Once the brownies are done and cooled, cut them into pieces. They don’t have to be uniform, just pieces you can crumble. Assemble the trifle dishes by having the Cookies and Crème Chex mix as the first layer. Then crumble the brownie on top of the pudding layer. Finally, add your gummy worms and you’ve got yourself some dirt and worms! Don't be squeamish! Grab a spoon and dive in - it's a delight!